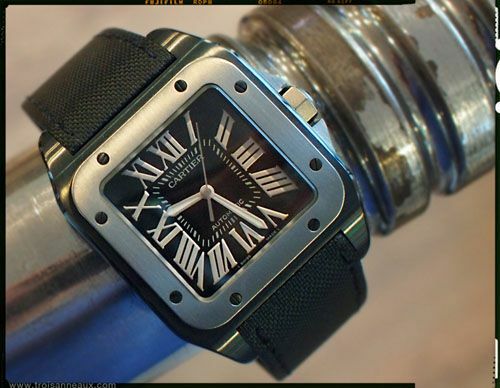 Today, I had a drink with some watch friends and one of them was wearing this Cartier Santos 100 Carbon. Geo, the owner and moderator of the Cartier forum over at Revo-Online, handed over the watch and I was blown away by the stealth look of this otherwise ‘classic’ watch brand. The stainless steel case had a ADLC treatment, the bezel and crown have been made out of titanium and the folding buckle is also a combination of ADLC stainless steel and titanium. This watch comes with a black fabric strap which perfectly underlines the ‘stealth’ look of this Santos 100 Carbon. The case measures 51.1mm x 42.6mm and with these dimensions, you better get some exercise to make it fit right. Geo took his watch to the gym and wrote an excellent photo report about it on his website (click here).